Review: Naila and the Uprising / It's Just Movies Review: "Naila and the Uprising"
Specifically, this is the story of Naila. In 1967, when she was a young girl at school, she learned her house had been blown up. She and her four sisters went home to see her father crying. She grew up with this experience of the Israeli occupation in Ramallah and dedicated her life to fighting for justice in Palestine. Little did she know that her devotion would contribute to a worldwide headline and cost the life of her first-born. There is a thriving woman’s movement within the Palestinian struggle for freedom and justice. More accurately, there is a struggle within a struggle. Palestinian women want an equal voice in Palestinian politics. Notably executive-produced by Abigail Disney, the more general aspect of “Naila and the Uprising” is that when women were involved in the leadership, the Palestinian struggle was most successful. When they were excluded, the struggle floundered and lost ground. Disney typically chooses films that reveal the strength, resilience, wisdom, and insight of women who involve themselves in movements of social-political change. Like in “Send the Devil Back to Hell” where women stopped a civil war and brought democracy to Liberia, “Naila and the Uprising” shows how Palestinian women have been effective in masterminding peace. But first, in both cases, women must get the men to allow them to be the leaders. As an aside, few Middle-eastern men can accept this and not all Middle-eastern women express it, but like the universal Me-Too movement, when an insecure ego manifests in arrogance and gender-supremacy, everyone loses. Though Naila’s activism has been supported by her like-minded husband, when exiled Palestinian leaders were allowed to return, they did not consider joining forces with the women who took their places. They just took over. This is Brazilian award-winning director Julia Bacha’s sixth film investigating the Israeli-Palestinian conflict. She has won several awards, including the Peabody Award for journalistic excellence. Having studied at Columbia University and specializing in the Palestinian conflict, she has become a world leader in explaining the Palestinian-Israeli conflict. 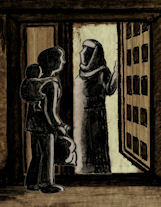 In “Naila and the Uprising,” Bacha has once again collaborated with the animation team of Dominique Doktor and Sharron Mirsky. Their work truly enhances the insight, feelings, message, and theme of Naila’s challenges. Through animation they show her incarceration and torture as well as her sadness and suffering. 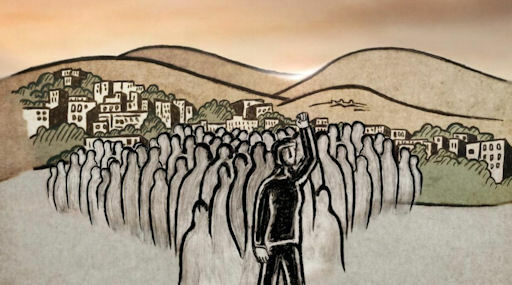 “Naila and the Uprising” was featured at the 2018 Human Rights Film Festival and will play on June 19 at The Churches for Middle East Peace (CMEP) Annual Summit in Washington DC.